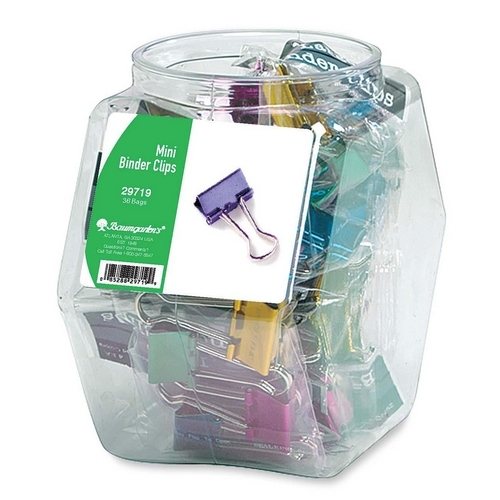 Tub display showcases Baumgartens Mini Metallic Colored Binder Clips in assorted colors. Cookie-jar design is made of clear plastic and has an opening at the top for easy access. Eye-catching 1/2" binder clips are perfect for signaling and binding short documents or for adding cover documents to the top of a file. Each binder clip meets or exceeds standard for RoHS compliance for lead, mercury, bromine, chrome and cadmium. Tub display contains 36 packs of mini binder clips with 12 in each bag.